Rev. Bernice Warren – “If I can help someone, then my living will not be in vain." “If I can help someone, then my living will not be in vain." My Journey – Thanks for Joining Me! It was with lots of fond memories and few regrets that Rev. Bernice Warren retired at the end of 2016 from the position she had held for more than 20 years, as Pastor/Director of Chester Eastside, Inc., formerly Chester Eastside Ministries,. “I see it as freeing me up to expand my ministry on behalf of social justice on a global scale,” she said at the time. Already on her agenda was becoming more active locally, nationally, in Haiti, and in Africa. She also felt called to continue to help young people be all they can be, a necessary component of her life’s mission of promoting social justice. However, her future work goals in the next chapter of her life were put on hold when she received a pancreatic cancer diagnosis in April 2017, ten days before her retirement celebration and gala. Since then, she has been unable to work and has incurred mounting medical and personal bills. Her generosity toward those in need has been ceaseless throughout her remarkable life. Now, she is seeking your monetary support to help alleviate this financial burden. Please show your support by contributing. Rev. Warren has dedicated her adult life serving God and her community. Success was not a given for Rev. Bernice Warren. She grew up in the Ruth L. Bennett Homes public housing project and attended Thomas M. Thomas Memorial Presbyterian Church, where she was influenced by the advocacy efforts of two of the pastors, the Rev. Dr. Carroll D. Jenkins and the Rev. Dr. Johnnie Monroe. “They made me understand how the church can be instrumental in changing the life of the community,” said Rev. Warren, who remembers one of the pastors opening the church to educators wanting to teach children when they couldn’t attend school because of a prolonged teachers’ strike. “You can’t just sit in church when you see poverty, violence, injustice and schools collapsing around us,” noted Rev. Warren. “Jesus spoke to this issue. He didn’t just stay in the temple. My ministry is a ministry of justice and I’m very clear on that.” She was also strongly influenced by her late mother, Lillian Warren, who she remembers “had no problem speaking out against injustice.” She often speaks of not visiting the beach until she was in the tenth grade. This was pivotal in shaping her career as an advocate and activist. She heard others talk about the beach and she saw images on television and in movie theaters. She also read magazine articles which made the idea of walking in the sand a far fetched dream but through the Swarthmore Upward Bound program, Rev. Warren was finally able to sink her toes into the warm tan sand. The ocean breeze was calming and the undulating salt water was therapeutic. The close proximity to the beach which was less than 2 hours away and the thought of not being able to get there was unsettling. It didn’t seem fair. It didn’t seem right. Rev. Warren reflected on her family’s monetary status as well as other families around her. How many of these families were caught up in the same predicament? The beach was only 70 miles away, yet due to the lack of finances she wondered if she would go to the beach again. It wasn’t just the beach. What other opportunities and experiences had she and the community missed? Rev. Warren felt everyone should have exposure to such simple healthy pleasures. If not the beach then a lake. Maybe camping. Her feelings were that healthy and fun activities would lead to positive outcomes for all those involved. A 1970 graduate of Chester High School, Warren earned her undergraduate degree in education from Kutztown State College, now Kutztown University in Berks County, and her master’s of divinity degree from Johnson C. Smith Seminary at the Interdenominational Theological Center in Atlanta, Ga. In between she taught high school equivalency classes in Chester. 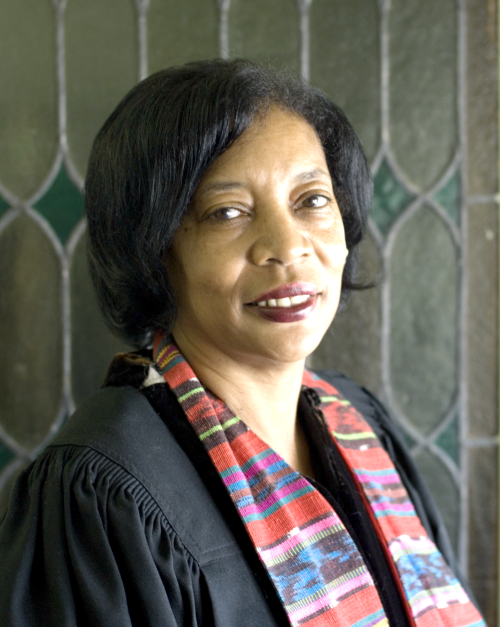 In 1980 Warren became the first African-American woman ordained as a minister in the Philadelphia Presbytery. She served as the assistant pastor for outreach at the Knox Presbyterian Church in Baltimore, Md., until 1984, underwent chaplaincy training at Delaware State Hospital, then served as pastor of First and Olivet Presbyterian Church in Wilmington, Delaware, for 10 years. In 1995 she was appointed by the Philadelphia Presbytery to replace the Rev. Tom Torosian as director and pastor of Chester Eastside Ministries, that was founded in 1985. Because the position had been vacant for several months, Warren had to rebuild programs. “I never wanted Chester Eastside to be just a service agency. Chester has enough service agencies. I didn’t want to be just a service provider but to be a strong voice and advocate,” said Warren. This was her opportunity to make activities available to children in the community with the same financial constraints she had known. With Warren’s guidance, Chester Eastside became the perfect conduit to offer the children of Chester the positive and healthy activities she once thought about in her youth . Dedicated to children and the community under Rev. Warren’s leadership, Chester Eastside formed a ski club, offered summer camps, an after school program, and provided cultural arts activities. Chester Eastside took children to the beach, camping, horseback riding, whale watching, glass blowing, swimming, skiing in the Pocono Mountains among a host of other experiences designed for the children of Chester. When she returned to Chester, the minister was surprised at how it had changed since the days of her youth in terms of jobs lost to companies leaving the small city, the proliferation of illegal drugs, and gun violence. But her greatest impetus to become heard in the community was when she realized the sorry state of Chester Upland schools that have been under state control for more than 20 years because of poor academic and fiscal performance. She started regularly attending meetings led by the state-appointed Chester Upland School District Board of Control and was once led out in handcuffs by police for refusing to sit down when protesting the proposed removal of a cap on the number of students attending charter schools because she felt that would drain much-needed funding for public schools. “I thought, ‘I’ve sat down long enough, maybe I’ll just stand.’ It really galled me that people from the outside were telling me to sit down because I was expressing my concern about Chester schools,” said Warren, who also once led a few verses of “We Shall Not Be Moved” at a school board meeting. Rev. Warren’s voice has also been strong against gun violence. With Fran Stier, a member of Ohev Shalom Synagogue in Nether Providence, Warren is co-chair of the Delaware County chapter of Heeding God’s Call, a faith-based anti-gun violence group that campaigns against what members describe on their website as the highly developed illegal trade of gun trafficking made possible through “criminal entrepreneurs, traffickers, the straw buyers who stand in for them to make their bulk purchases and gun dealers who look the other way and enjoy the profits.” She has also been active with Chester Watch, a group working on issues affecting immigrants. Rev. Warren’s activism and giving hasn’t been isolated to local places. She has provided assistance on a global scale as well. She has led mission trips to Haiti where she has taken over 100 bags of luggage containing food, medicine, school supplies, clothes, and personal items. Sparking change after Hurricane Katrina, Rev. Warren traveled to Jackson Mississippi to see the damage first hand. She later returned to Pearlington, Mississippi to help rebuild homes ravaged by the hurricane and to advocate for those in distress. Rev. Warren led a delegation from the National Black Presbytery Caucus to Ferguson, Missouri in response to the Michael Brown killing and the subsequent unrest. Rev. Warren dedicated her adult life serving God and her community.